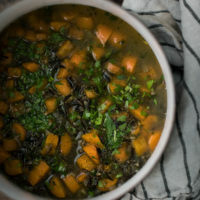 Wild Rice Soup with Carrots and Parsley | Naturally.Wild Rice Soup with Carrots and Parsley | Naturally. Scrub the carrots, trim the ends, and cut into ½” thick half circles; set aside. Heat a large pot over medium heat and add the olive oil followed by the minced shallots. Cook until the shallots are fragrant and soft; 5 to 6 minutes. Add in the garlic and the cut carrots, cook for 1 to 2 minutes more. Measure in the white wine and cook until mostly evaporated. Next, add in the wild rice, broth, and 1 cup of water. Bring to a boil, reduce to a simmer, and cook until the rice is tender; 30 to 40 minutes. Remove from heat and stir in the parsley, lemon zest, and lemon juice. Taste and add more salt as desired (this will greatly depend on the broth you use). Tips & Tricks: I like to start with just the 3 cups of broth and add water as needed to thin out the soup. This ensures you won’t end up with an overly broth-heavy soup. Also, if you don’t have wine open already, just skip.